Perfection! "Premier" unit available in building with 5 total units. Lovely professionally designed gardens surround private flagstone patio. Home sits high on lot with exceptional sunny/bright SW exposure. Lives like a SFR with front yard. Private, welcoming entrance with gorgeous front storm and wood doors. Limestone surround on wood burning fireplace. Brazilian cherry wood floors. Open LR/DR/Kitchen. Crown molding, leathered granite countertops, custom lighting, stainless steel appliances, gas stove, pantry, cedar closet, custom closets, stained glass back door, newer high-efficiency boiler, newer windows, large deeded storage area and 1-car garage. Maintenance-free living on a gorgeous block with million dollar + homes. 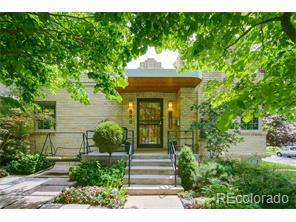 Walking distance to Cherry Creek North shopping, art galleries, restaurants, the Cherry Creek Mall and Trader Joe's! Walk Score 63.